A good story conflict can grip a reader and hook them for the duration of your entire novel—but coming up with that perfect problem or plot twist is sometimes a challenge. Readers read for characters—they fall in love with them and sometimes go as far as to ship them with other characters. Readers tend to invest in a character’s life with the same intensity as one might invest in reality TV. So if they’re not invested, or if they don’t care for your characters… there’s no emotional hook. And therefore, no matter how juicy your conflict is, your reader isn’t going to care. First of all, you have to craft realistic, likeable, unique characters who are compelling enough to attract a reader’s interest and make them care for the character. Every choice should leave the reader cheering or crying. 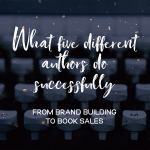 The character’s morals and upbringing should either resonate with your reader, or come from a place where the reader can sympathize with or understand their choices. If your conflict exists for the sake of having a conflict, it’s not going to be meaningful. Instead, you want to craft a conflict that affects your characters and sabotages their desires, actions, and progress through the story—creating an emotional reaction in the reader. A good example of a conflict that is not meaningful is for a mean girl to start bullying a main character who has high self-esteem and isn’t phased by haters. There’s no plausible reason for the main character to get upset unless the mean girl hits a pain point, such as a hidden fear or insecurity. A way to flip this would be to have the main character hide an important secret (e.g. shoplifting) that is then jeopardised by the mean girl’s harassment (threatening to reveal the secret). Whatever conflict arises in your novel—it needs to be something that’s going to affect the characters based on the backstory you’ve created, or the desires they want to achieve, or the relationships they’ve formed. If you’ve done a good job of creating an emotional hook, all of these things are going to play on a reader’s emotions. So then when you introduce a conflict that puts everything at stake, it’s meaningful to the reader because they can see how terrible it would be for the character to fail and they feel strongly in their heart that they want the character to succeed at their goal. Coming off of the past two points, stakes and morals are crucial when it comes to creating conflict. The bigger and better the stakes, the more gut wrenching and gripping your story will be. Likewise, morals can directly hook a reader because they also have their own morals (and therefore opinions) that will determine how important a story is to them. A good example of poor story stakes is when magic systems in fantasy novels have no limitations–for every ‘strong magic’ there is a strong remedy, or a more powerful spell. It eliminates reason for the reader to worry about a character’s wellbeing. Your stakes need to be very clear and as unpredictable as possible. Ask yourself: what does the character stand to lose or gain? This is your stake and it should directly impact the conflict. Likewise, you don’t want the reader to be able to guess how you plan to make your character go about solving a conflict. In some circumstances, potential solutions are more obvious, so try and surprise the reader with something they could never see coming. Otherwise it will be a letdown for them. As for morals… it’s a good idea to be clear on who you’re writing for and why you’re writing a particular story with the themes and issues you’ve chosen to focus on, as this can help craft a better conflict for your readers. For example, if your reader has struggled with body issues or mental health issues and is reading about a character who is also struggling with these issues, their morals are going to resonate with the reader more compared to somebody who has never experienced those kinds of issues. 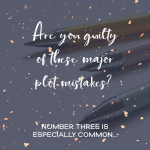 Are You Guilty Of These Major Plot Mistakes?